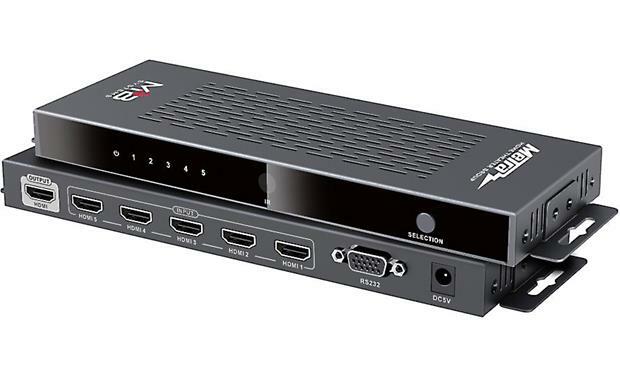 This versatile 5-input, 1-output switcher will feed multiple HDMI sources to a single input on your TV, sound bar, or receiver. It's perfect for situations where you're limited on available inputs, or want to run a single HDMI cable to your TV or projector. Use the front-panel input button or the included remote control to quickly toggle between connected devices. 5x1 HDMI Switcher: Metra's CS-HDM5X1SW3 HDMI switcher incorporates five HDMI 2.0 inputs with one HDMI 2.0 output, allowing you to share and switch between multiple standard definition, high definition, or ultra high definition source devices (like a Blu-ray player, Game Console, Satellite/Cable receiver, network media player, and more) on a single display (like your flat-panel TV or front projector). HDMI 2.0 w/ 4K (60Hz) Support: Metra's 5x1 HDMI 2.0 switcher is compatible with ultra-HD video resolutions up to 4k @ 60Hz with support for 12-bit color. It is also compatible with high definition video up to 1080p @ 60Hz; even 3D video. It is also compatible with high definition video up to 1080p @ 60Hz; even 3D video. Other video resolutions supported include 480i, 480p, 720p, and 1080i. The switcher is capable of receiving and transmitting video bandwidths up to 6 00Mhz/10.2Gbps. Up to 7.1ch Audio: The 5x1 HDMI 2.0 switcher supports up to LPCM 7.1ch, Dolby TrueHD, and DTS-HD Master Audio. HDCP 2.2 Compliant: HDCP 2.2 is supported by all of the HDMI switcher's inputs & outputs; HDCP is short for "High bandwidth Digital Content Protection" and is used for 4K video copyright protection for compatibility with 4K Blu-ray players and 4K Satellite/Cable providers. Remote Control: In addition to the HDMI switcher's front-panel input select button, the included IR remote control allows you to wirelessly operate the switcher and select source inputs (1-5). The unit is equipped with a front-panel IR receiver. Controls include Power On/Off and HDMI Input (1-5) selection. RS232 Port: The CS-HDM5X1SW3 HDMI switcher is also outfitted with a RS232 port for control from your computer. Controls include Power On/Off and HDMI Input (1-5) selection. LED Indicators: The 5x1 HDMI switcher features four LEDs to indicate Power & Inputs 1-5. Power Requirements: Metra's CS-HDM5X1SW3 HDMI switcher operates off of standard household current using the supplied AC power adapter (Input: 100-240V ~ 50/60Hz, 0.2A; Output: 5.0V/1A). Mounting Options: The CS-HDM5X1SW3 HDMI switcher can simply be placed horizontally on a flat-surface, such as on top of a shelf of a piece of AV furniture. It also comes with two mounting brackets to mount in vertically on a wall or piece of AV furniture (wall-mount screws not supplied). Hello. Will this HDMI switcher support Apple TV 4K input/output (content)?